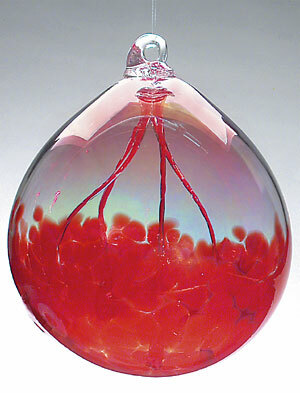 Virgil's Art Glass handmade blown glass witches balls, ornaments, friendship balls in sixty four plus colors. Welcome to Virgil's Art Glass. I make hand blown glass witches balls, fairy balls, ornaments, friendship balls, floats, garden orbs, and yard balls in 64+ colors and fumed with a mother-of-pearl luster. Check out the "DISPLAY IDEAS" pages to see how my work would look in your store!! a Witches Ball or a Fairy Ball!! Only a witch, a fairy or the glassblower that makes it can tell the difference. and your choice of hangtags: Witch or Fairy. Glass Witches Balls have been used for home protection against evil spirits and witches spells for centuries. The bad spirits are drawn into the beauty of the glass and are snared in the strands inside protecting the home from harm!! 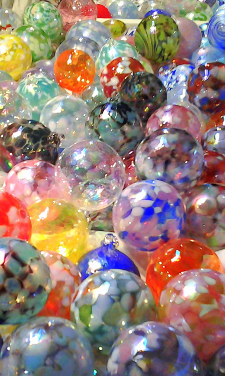 Fairy Balls attract and delight fairies with wonderful colors. The "bridges" of glass inside convey the good feelings from the fairy and bring the owner luck. Great for gift occasions, thank you's, special feelings, or hanging in a window, or even on a Christmas tree!! Each one comes with a nice, friendly GREETING CARD hang tag that can be personalized by the gift giver. Virgil's Art Glass is a wholesale art studio. My work is sold through galleries and retail stores throughout the United States and Canada. If you are a retail store interested in carrying my work, you can reach me by email, phone, fax or post.